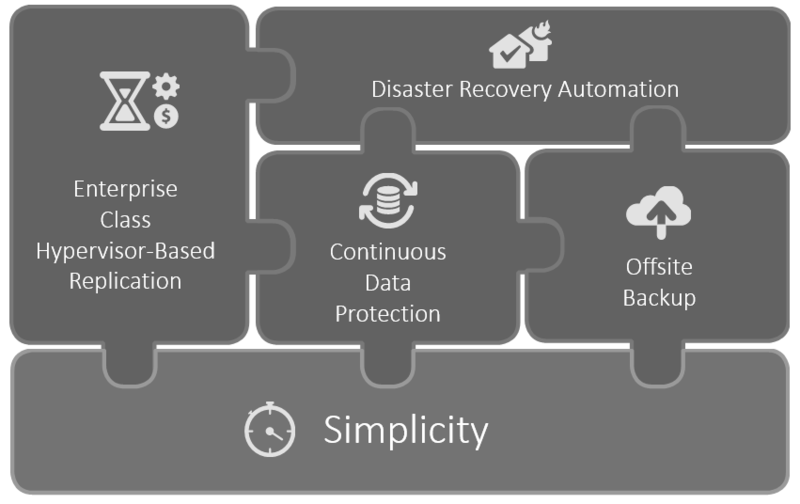 Maintaining the simplicity of disaster recovery across multi-hypervisors, clouds and storage platforms. Protecting virtual machines (VMs) with an enterprise-class replication engine that protects and recovers multi-VM enterprise applications consistently. Minimising data loss through low Recovery Point Objectives (RPOs) and point in time recovery using Continuous Data Protection. Disaster recovery automation to orchestrate and automate migrations, disaster recovery, and testing processes to deliver Recovery Time Objectives (RTOs) of minutes. Offsite backups to keep a third data copy, ensuring recovery from any disaster and managing long-term retention of server backups. Each of these BC/DR challenges can be solved by implementing multiple business continuity and disaster recovery technology solutions, each requiring its own skill sets, management overheads, cost centres and complexity. With added complexity, the cost of managing multiple solutions increases, testing of each element becomes infrequent, and the reliance on individual knowledge introduces a significant risk to the organisation of not being able to successfully recover from a disaster. The AssureStor dr2cloud Virtual platform delivers all the features required to provide a complete BC/DR solution in one simple to use cloud-based solution. This makes it indispensable to organisations of any size that have embraced virtualisation. By replicating in the hypervisor-layer using simple, scalable software, the dr2cloud Virtual platform removes technology lock-in. This is achieved by enabling VMware replication or Hyper-V replication from any storage to any storage, between multiple hypervisors and multiple clouds. dr2cloud Virtual delivers disaster recovery protection with freedom of choice, based on cost, performance and SLA, not technical limitations. dr2cloud Virtual utilises continuous data protection to minimise data loss by delivering RPOs of seconds, with point in time recovery down to the second and up to 14 days in the past, removing the risk of data loss by restoring from backups. Built-in business continuity and disaster recovery orchestration, automation and migration ensures that failover, testing and migration operations are as simple as a few clicks, delivering RTOs of minutes without any need for the knowledge of individuals to facilitate recovery. This removes significant risk and complexity. Offsite backups create a third copy of the data in a secure, separate data centre location to ensure that the environment can always be recovered as a final failsafe, with the ability to store backups indefinitely to meet long term data retention requirements. Request an online demo of the AssureStor dr2cloud Virtual platform, powered by Zerto.